Beautifully remodeled cabin located on 1.5 acres located in the coveted Aska adventure area. Hot Tub with LED lights, waterfall, lounge seat, and seating for 4-5 with multiple jets. Fully furnished kitchen. New grill added in September of 2015. Perfect for anything you want to do from shopping in Blue Ridge (only 4 miles away), to mountain biking and hiking trails only minutes away. Go floating down the Toccoa River or just relax on the deck and take in the treetop views. We welcome your dog to stay with us! This house is the in perfect location! House has 2 bedrooms, 2 bathrooms, finished basement with futon couch which will sleep 2 additional. 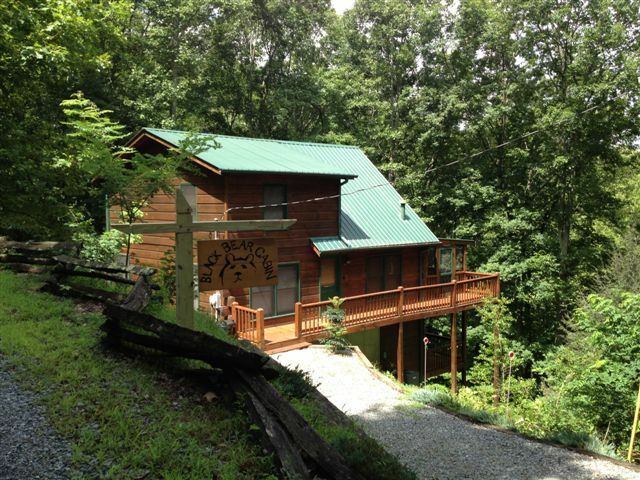 Andrea and Phil Laney purchased this log cabin because of the beautiful treetop views. They have been improving the cabin with new furniture, upgrades and amenities every month since they first got it. Phil grew up in Florida and vacationed in the Georgia mountains as a child. Owning a log cabin in the Ga mountains has always been a dream that finally came to fruition for this Ga Tech grad in 2011. Andrea and Phil enjoy visiting their cabin several times a year with their two children. The kids love tubing and fishing in the nearby Toccoa river (only 2 miles away). Aska trail head is only 0.4 miles away. Toccoa river is only a 5 minute drive away to get to beautuful tubing river. Lake Blueridge is only a 8 minute drive to the Marina or 4 minutes to the nearest boat ramp. shopping in Blue Ridge, mountain biking, hiking, fishing, hunting, horseback riding, slate top pool table, hot tub, entry to the Aska trail system is only 0.4 miles away! 2 story deck Lake Blueridge lake access is only 2 miles away! toilet, combination tub/shower, Large private bathroom off the main loft bedroom. toilet, shower, Full bathroom on the main floor. Trane central heat and AC system. There is an outdoor fire pit. Great for roasting marshmellows. Fully furnished kitchen with full size refrigerator, stove, oven, sink, dishwasher and all standard cookware and silverware. Flat screen TV in main living room mounted over the fireplace. Pool table and dart board in large daylight basement area. An assortment of Board games is provided. The marina on lake Blueridge is only 4 miles away. Hot tub on lower level porch with LED lights and waterfall. Cabin was cute and in a great location. Sunset through the trees on the back porch. Generous porch space and good layout. Unfortunately a lot of that was overshadowed by a variety of cleanliness issues: cabin was covered by layers of dust and cobwebs, loft windows were so dirty it was difficult to see through them, obvious stains on floor and mattress that hadn't been addressed. Additionally, we were not left with basic supplies (paper towels, toilet paper, kitchen sponge, daily cleaning supplies) to get us through the week we stayed and had to purchase everything ourselves. Everything was as described in the cabin with everything we needed right there. It was very cozy and the views amazing. There was so much to do between the pool table, darts, hot tub, movie selection they had there, and the fire pit outside. We really enjoyed our stay and would love to come back! My daughter and I stayed at black bear cabin for 5 days. There's more to the cabin then the pictures reveal. There's more then enough room on the top floor sitting area and lower level sitting area, even for a bigger party. The cabin is cozy, clean and well kept. One of my biggest pet peeves is an old shower. So that's one of the first things I checked and it actually seemed new or just that clean. Lol. But the hot tub, the downstairs game room, gameboards, and the morning view was great. We even saw deers just a few feet away. The owner's are very dedicated to making your stay a home away from home. I will definitely be back. very nice location close to hiking trails and down town but still gives you the feel of the country. Only down side was the drive way my car keep slipping going up. This rental property was extremely nice and I would definitely recommend it to anybody else looking to rent a cabin in the Blue Ridge Area. The cabin itself is very nice and comfortable for individuals as well as groups. the amenities are very nice and the location is even better. The cabin is within walking distance to the Aska Trails as well a 10 or so minute drive to downtown blue ridge. the view from the porch is very nice especially in the morning when you are able to watch the sunrise. The owners of this property were easy to reach and responded rapidly to any questions that needed to be answered. Rented this for my daughter and her husband. They LOVED it! Delightful cabin in a great location! Downtown Blue Ridge is a beautiful tourist oriented town that has not been overbuilt or compromised on. There are nice Bars, restaurants, shopping, ice cream shops,outdoor outfitters, that all have a quality, high end feel along E. Main street in downtown Blue Ridge. I recommend Black Bear Tavern in particular. Say 'Hi' to Dan the owner who can often be found there on the weekends. The scenic train rides leave from the center of downtown, or you can rent bicycles from Cycle South and check out the local trails. There are two great fly fishing stores on E. Main street as well that can tell you where all the great local fishing spots are and get you outfitted with any gear you might need. If you bring a pet, you are required to let us know prior to your stay. If you do not notify us at the time and we find out you brought any animal, you will forfeit your damage deposit.